PCs finally reached the stage where performance doesn’t matter much. Certainly mainstream PC systems deliver enough performance for most users, often at price points well under $1,000. Even serious PC gamers fell off the upgrade train. That’s likely one of the drivers explaining the doldrums in PC sales: once you have enough performance, why upgrade? The hardware industry tried to push users to 4K gaming, but most users lacked interest. The new 21:9 displays attracted more attention, but even a 34-inch wide, 3440×1440 pixel display only pushes five megapixels. I’ve played games like Rise of the Tomb Raider and Fallout 4 using a single high-end GPU with most of the eye candy maxed out, with very good frame rates on my Dell UltraSharp 3415w. Even XCOM 2, which seems like a performance hog, runs just fine. The game changer is coming, though: virtual reality. Prices for first gen PC VR headsets look pretty steep: $599 for Oculus Rift retail and $799 for HTC (Valve) Vive. Pricing for future generations will drop, as the technology matures, more users jump in, and component costs drop, as they inevitably will. However, even traditional early adopters seem a little confused — not about product choices or cost, but about their PC systems. It turns out, the price may actually be higher, depending on the age of your PC and its component mix. I guess I’m VR ready. Valve helpfully released a VR test tool, which runs a performance test using assets from Portal 2. Running the performance test tells you what your VR experience might be. Valve’s test generates a report with a small rolling performance chart, the number of frames below a target 90fps frame rate, and a single synthetic number, which Valve calls “VR Fidelity”. I used that number, plus frames I ran the test on 11 various PCs used in my home. I’ve attached and image of the test result window which popped up after running the test on my main PC. Clicking on the image should pop up a larger, more readable version. The wall of text in the middle offers up a couple of key points. First, while the benchmark takes into account CPU performance, that only really applies to CPU usage for this one test. Other applications may need more CPU horsepower for positional tracking or other tasks. Also, USB throughput isn’t tested, which is likely not an issue with most relatively modern PCs. I’d bet good money you want to connect your VR gear to a USB 3.0 port, however. All the PCs listed include a minimum of 8GB of fast memory; several have 16GB. My production rig uses 32GB DDR4, while 16GB DDR4 resides in a 6600k-based system. Two systems run Skylake CPUs, one runs an older Core i7-3820 (quad-core Sandy Bridge Extreme), and another uses an AMD FX-8370. The rest are all Haswell-based PCs running a variety of different CPUs, all over 3GHz. The rest of the graphics cards include 4GB or more of frame buffer. I make no claim of scientific rigor, since CPU/GPU combinations varied, as did frame buffer and system memory size. However, 11 systems constitutes a pretty reasonable sample size, so let’s look at a chart, sorted by the VR test’s score results. GPUs range from a super high-end Titan X down to the lowly GTX 760. The frames rendered seems to weakly correlate to CPU performance, but the GPU is also a factor. What’s not shown is the number of frames below 90fps; only two systems showed any frames running below 90fps. The GTX 760 system posted a whopping 35% below 90fps (3160 out of 9024 frames). Only four frames ran under 90fps in the GTX 680 / Core i7-3820 combo. 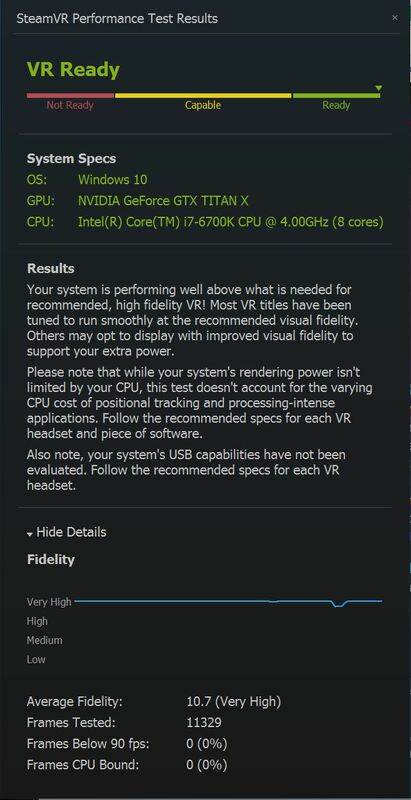 However, the VR fidelity test seems to like newer GPUs better. 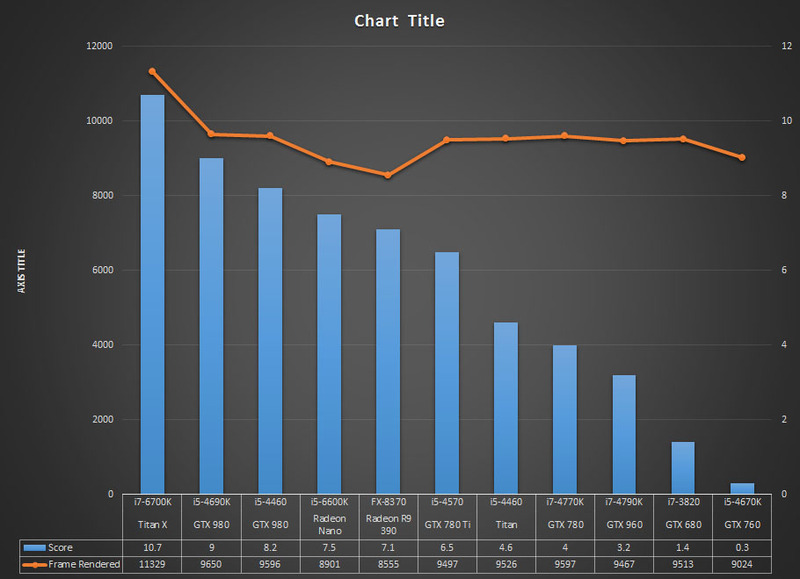 The GTX 980 posted a much better score than the GTX 780 Ti. And what’s up with that original Nvidia Titan score? What all this really means is that modern systems running high end graphics cards and midrange CPUs perform well on Valve’s VR test. It’s likely this correlates well with VR application performance, but this benchmark lacks any information on potential such as micro-stuttering. So if you’re interested in running one of these pricey new virtual reality headsets, make sure you have a modern, relatively high-end GPU. The CPU may be important, but any midrange processor should have the right oomph.